Network-ready and faster than ever, Lexmark's E342n offers an outstanding value for small workgroups. And its exclusive design features will simplify the way you work! The E342n is ultra quiet and combines an attractive acquisition price with high-yield 6K aftermarket cartridges. But low noise and low cost doesn’t mean low performance. The E342n reaches rapid print speeds of up to 28 ppm and a time to first page as fast as 7.5 seconds. Just plug it in and go! 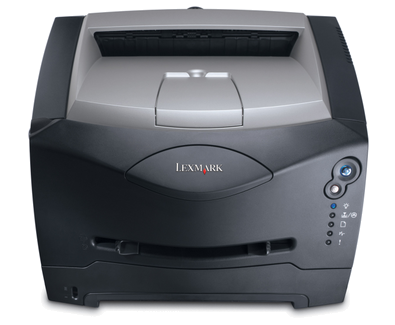 The E342n comes with Lexmark’s award-winning MarkVision Professional software, which practically does all the set-up and configuration for you. It also offers a wide range of proactive network-management tools, such as automated email alerts for low toner and paper. Now everyone’s a printer expert! Significantly optimise your time. In addition to user-friendly buttons and front-loading consumables, the E342n is equipped with an intuitive 2-line LCD screen. So your users get the clear instructions they need to manage printing and maintenance tasks quickly and easily. 1Povprečna vrednost standardno natisnjenih strani je deklarirana skladno s standardom ISO/IEC 19752.